Does evil stand out in a crowd. Or does it masquerade and blend in by looking pretty much like everything else? In "Captors" at the Huntington Theatre, aging Nazi war criminal Adolf Eichmann has been tracked down after hiding out in Argentina for more than a decade. At just the right moment, he's snatched off the street and taken to a secret location outside Buenos Aires where his three rather inexperienced captors -- all part of Mossad, Israel’s central intelligence agency -- make plans to transport him to Israel where he will stand trial for his crimes. Incredibly, Eichmann had to consent to stand trial. And his signature was needed in order for the case to proceed. Eichmann, of course, played a major role in sending thousands of Jews to their deaths in the concentration camps. Yet he claims, with calm resolve, that he never killed anyone himself. Told in flashbacks thirty years after the capture, the suspenseful new drama by Evan M. Wiener is based on Eichmann in My Hands, a memoir by Peter Z. Malkin and Harry Stein. In the play, Malkin is chronicling his memories, often struggling with details time may or may not have blurred. Of the three men pursuing the Nazi criminal, it was Malkin who had the most contact with Eichmann during the ten days he was being held. (It was also Malkin who actually grabbed him off the street. ) And despite the group insisting Malkin not interact or even speak with their catch, he does. Which opens the door for Eichmann to get inside Malkin's head and try to establish the case that the two men are actually very much alike. They are both soldiers. Carrying out orders. Doing their duty. 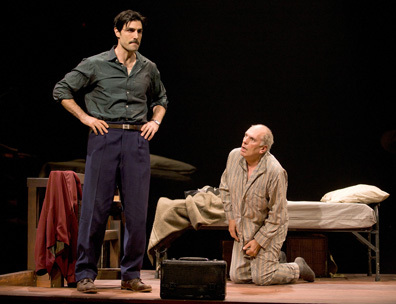 The game of cat and mouse reverses when Malkin uses their uncomfortable relationship to play to Eichmann's need to have a platform to explain his role in the atrocities. As Malkin carefully massages the situation, it almost becomes Eichmann's own idea -- after 30 years of silence and anonymity -- to sign the forms to assure his moment in the spotlight in Jerusalem. There are several truly chilling moments throughout the evening, including the crashing end of the first act when Eichmann dons a uniform to wear as a disguise when he's spirited out of the country. Louis Cancelmi (far left) gives a brilliant performance as Malkin, proud of his work and wanting the recognition of a job well done. I particularly liked the authenticity of his speech pattern -- the way he peppered his conversation with Eichmann with "Mmmm?" between statements as his way of confirming truths and demanding of the listener," You see?" "You understand?" Michael Cristofer (above, at right) is Eichmann, initially trembling like a child when captured and subjected to the tactics of isolation and disorientation, only to gain his footing as he works his cunning ways to turn his captor into a prisoner. Driven by different goals, both men are motivated by having their place in history seen correctly. At least through their own eyes. Daniel Eric Gold rounds out the cast as a student who serves as Malkin's assistant in creating his biography. 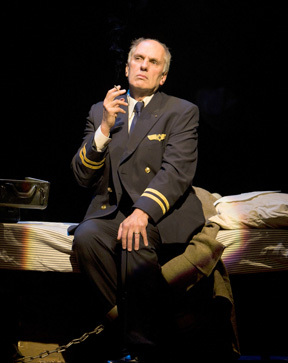 While Gold both opens and closes the play as narrator, he could be utilized more between the two. The inventive set, designed by Beowulf Boritt, is all of one piece while depicting four separate locations. Three ceiling pieces, each hanging off-kilter, add an appropriate uneasiness. The Huntington's Artistic Director Peter DuBois directs, giving the production a tense, shadowy feeling, as though we're working our way through the taut but murky inner machinations of the mind. 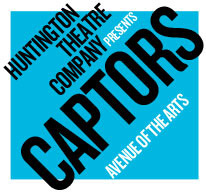 "Captors" is at The Huntington Theatre through December 11. For information, call 617-266-0800.